Kerala Fish Curry or Kottayam Fish curry is the most popular and easiest fish curries from Kerala. It is also referred to as Red Fish Curry for it is cooked in red chillies and spices with a kick of coccum. Kerala is divided when it comes to food. Look at this one now. 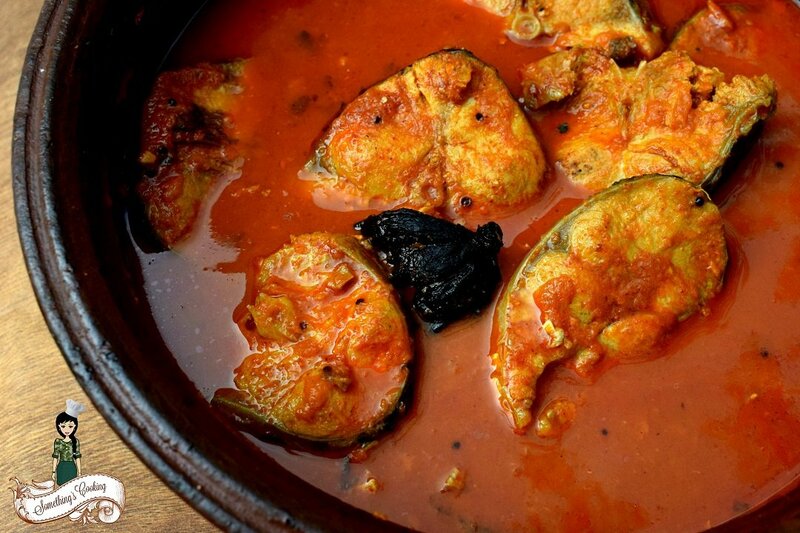 There are many varieties of fish curries in Kerala and this one is my favorite. I hail from the Travancore region of Kerala, Kottayam. The specialty of this fish curry is that we use black coccum aka kudampulli in it unlike tamarind in other fish curries. Also, another major difference you can find is the absence of coconut. 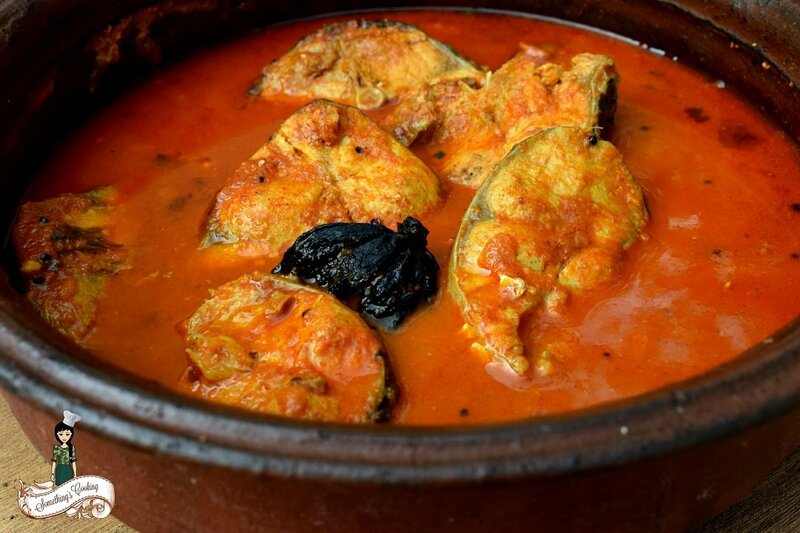 It is said that fish curry made with coccum stays fresh for a longer period of time. At home, we keep it for a good 4-5 hours before serving. Authentic Kottayam Fish Curries are kept overnight. Thus, it is also called Yesterday’s Fish curry 🙂 I keep for a couple of hours so that the spices get induced to the fish properly. 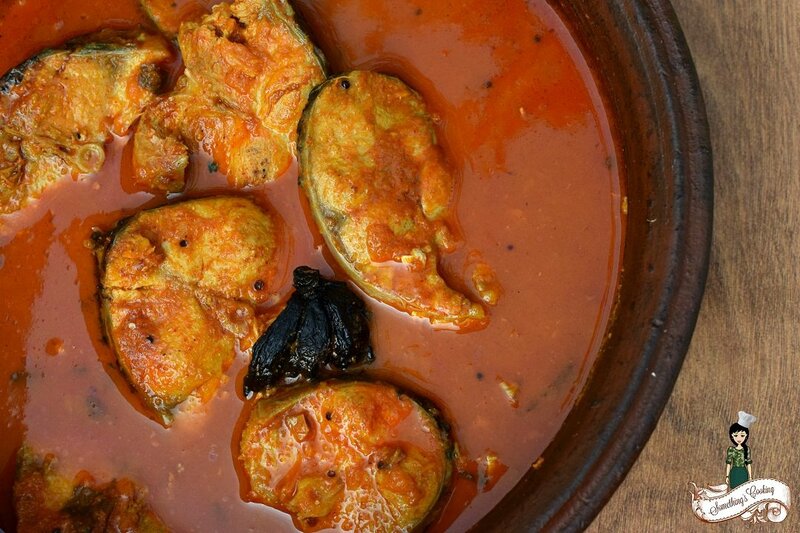 Traditionally this fish curry is made in a “man chatti” or clay pot. I used my normal brown clay pot. 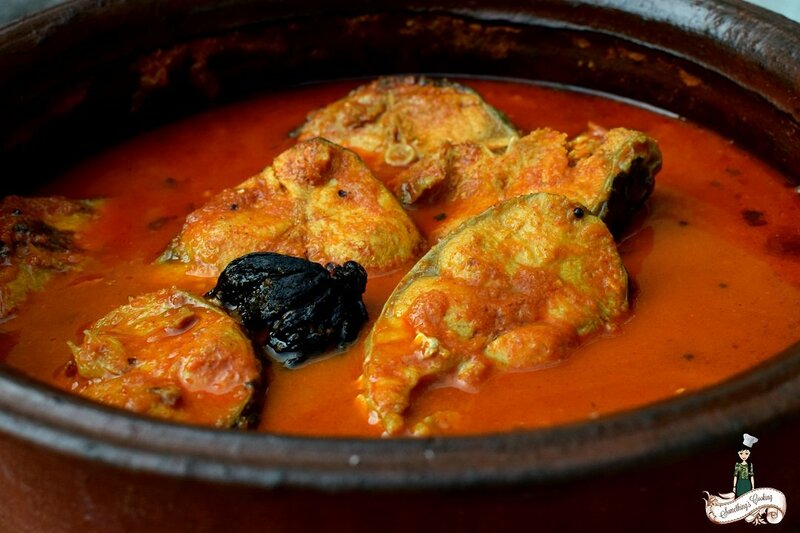 You can also try to make in the black clay pot as it helps in bringing out the taste of fish curry to perfection. Fish: ½kg You can use Mackerel. I couldn't get it though. Soak coccum in little water for 10 minutes. Keep aside. Mix the chili,coriander & turmeric powders together with coconut oil/water to make a paste. Keep aside. Heat oil in a clay pot or a pan & splutter mustard & fenugreek. Add crushed ginger garlic paste & stir for a couple of minutes. Add small onion & curry leaves & saute till it becomes soft. Add the masala paste and salt & fry till oil starts appearing. Add coccum along with the water & fish pieces. Combine well. It will be safer to rotate the pan to ensure that fish & masala is mixed well. Add required amount of water. just so that the fish pieces are immersed in it & cook till the fish is done & gravy becomes thick, it will take around 20 -25 minutes on low flame. Bigger fishes like sardines, mackerel, seer fish, butter fish, pomfret are always preferred. You may use onion instead of shallots. But the taste may vary. Check other Fish recipes here. 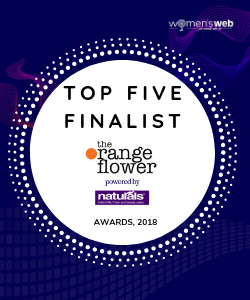 P.S: I have been nominated for the Orange Flower Awards for Digital Creative Superstars in food blog category. I’d be honored if you vote for me. 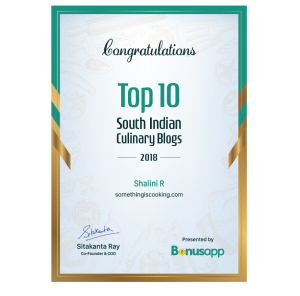 Please click the button, and look for Shalini in the search box. Enter your email and vote. ♥ Thank you! My mouth is watering. Will it spoil the dish if we fry the fish a bit before putting it in? Making a dish in clay pot adds to the flavour of the dish. I am imagining the sour taste of this curry and I can feel a tingling sensation! Seriously, everything you make looks amazing! Wow! I am craving for some fish right now. This looks delicious and I’m sure it tastes amazing. Wow Shalinilooks yummy and delicious!!! !